I really love pineapple in cakes and when you put pineapple with carrot, I think it is really something special. 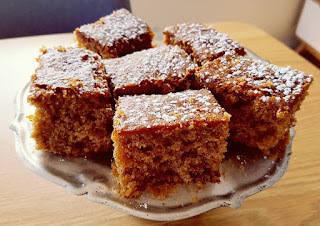 This is a really easy cake to make and it is packed with tonnes of flavour. When I first made this cake, I recall that the recipe called for wholemeal flour. I am not a fan of wholemeal flour so I have always made it with white flour. This time however, I made it with gluten free flour. I used the White Wings Gluten Free Self Raising Flour that comes in the orange pack. It worked really well. There was no difference between the normal version and the gluten free version. If you like you can ice this with either a lemon glace icing or a cream cheese icing. I like to serve it hot (zap in the microwave) with icecream. 1. Grease and line a 23cm square cake tin. Preheat the oven to 160 degrees. 2. Place all the ingredients in the bowl with the kneading blade, in the order specified. 3. Select Pastry P1 for 1min. 4. After 30 sec pause the machine and scrape down the sides. Resume program. 5. When program is complete, pour the batter into the tin and level off. 6. Bake in the preheated oven for 30-40 minutes or until a skewer inserted in the centre of the cake comes out clean.